All things “bio” are becoming a hot topic as companies continue to move toward more sustainable business practices and products. Renewable feedstocks, such as corn, are a headliner in this movement as we learn from Biocognito’s Nathan Danielson during the Corn Utilization Technology Conference (#CUTC16). The company is a small consulting firm that counsels businesses working to bring new technologies to the biomaterials space. He said that many of his clients are located in California because there is great interest in new materials and discovering new ways to use corn. He added that there are a lot of private investors that are excited about this area as well. Danielson was very involved in the planning of this year’s CUTC conference and served as chair for two sessions. 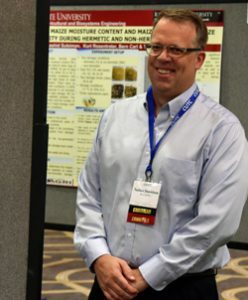 His panel focused on near-term and long-term technologies that have a significant potential to increase corn utilization from lab to commercialization. “One of the things I challenged the speakers to think about was how do you find a home for the next one billion bushels of corn,” said Danielson. Check out pictures from the conference: 2016 CUTC Photo Album.